Or should that be Cat and Harris? Anyway, Saturday us husband's and my 6th wedding aniversary. omg it's been SIX years. Crazy. So he suggested we get "his and hers Makies" lol. Was I really gonna say no to more Makies? So they arrived today. There was some concern they wouldn't arrive in time and due to a delay with the labs, they had to come without their outfits ahem. Cat is one of hubby's characters, Harris is mine. Now for some background. Cat and Harris have been friends since childhood. They exist in a universe where everyone has some sort of superpower, even if that does mean 90% of people have really minor powers like "can eat really spicy food" or "can tell you precisely how hot/cold it is today". In Cat's case, she can shrink. Harris though, his power is more... difficult. Technically his ability is a form of mass hypnotic suggestion, but his subconcious being the messed up thing it is, that suggestion is always the same: "sing and dance." His life is like living in a musical. He goes to the store, the checkout clerk starts to sing. He goes to the laudromat, an elaborate song and dance routine breaks out amongst the driers. He HATES musicals, and he finds this all not only frustrating, but embarrassing and humiliating. He's somewhat of a recluse as a result, he hates people anyway, the whole musicals thing just makes his plan to destroy the planet with orbital death lasers more determined. He loves to built robots, he rants about building a death mech to destroy the city but Cat's PRETTY sure that's just angry rambling... but just in case she carefully sabotages any particularly dangerous looking machine of his. He may or may not be completely insane... dum de dum. She works as an governmental agent tracking down hostile or dangerous individuals. (like mutant fbi basically) while he works as a graphic designer. A job which allows him to mostly spend his time in the basement drawing rather than facing the real world. Most of his cliental communicate over email, which suits him perfectly. He hates having to meet them face to face, and sulks about it a lot to Cat who's less than sympathetic. They live together in a house Cat inherited from her grandmother. They have a strange relationship. Old old friends, occasional lovers, frequent rivals. At the end of the day, they love one another deeply though don't ask them to admit that. Anyway, here they are dressed. Yes, Harris didn't get shoes. I was in too much pain to go dig through the shoe box. Also, I figured no shoes suited his slob "sits in a basement all day on a computer" persona hah. He should probably have more stains on his clothes though. Ahem. 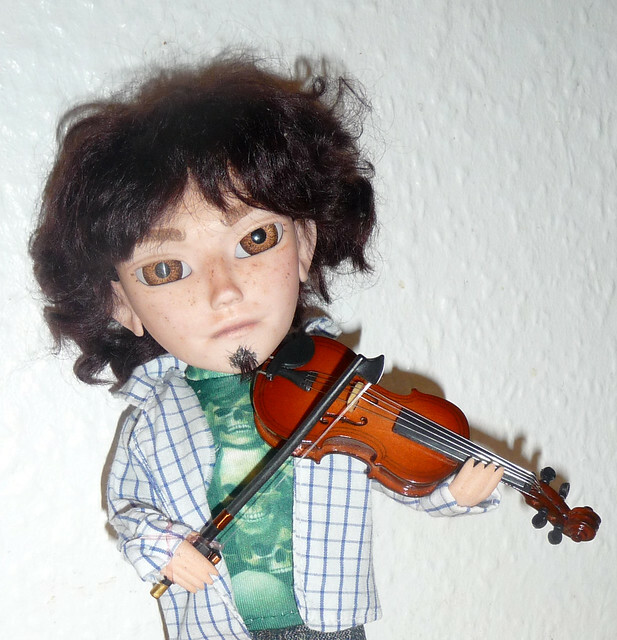 When not plotting to burn the planet in nuclear fire, Harris unwinds by playing the violin. Go figure... His mother was a music teacher, she forced him to learn an instrument. Cat can tell when he's had a really bad day by the sound of classical music coming from the basement. Arrrrggg! I love them! I love the dungarees! ( I have a thing about them) And the goatee! How??? Great story! 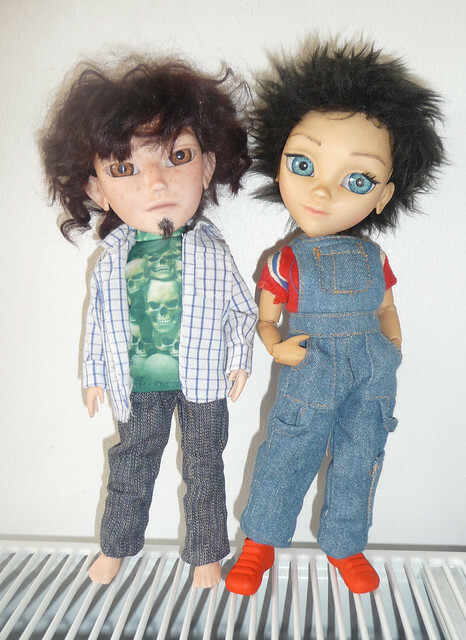 Are these two a part of the same "universe" as your other Makies? It's really great to collaborate with your partner on creative endeavors, isn't it!? Jupiter: Different universe, but i'm sure they'll end up hanging out anyway. Only problem I have with collaborating with other half is that he has a tendency to take over. Boo. So I kinda ignore him and go my own way lol. I'm mean. They both are adorable! Happy anniversary p_m! They are both great and it was wonderful reading their story. Harris's facial hair worked out well. I've been scared to try it so far. Haha, whoops! I think I'm more the take over partner in my relationship. Got to work on that! I tend to do it more with crafting projects since I've had more training in arts and crafts. I've got to watch myself and make sure my help is actually helping. I thought they might be separate, given that they have powers. I haven't kept to one universe either, too restrictive! P.D who's a courier and has this odd ability that means pigeons (only pigeons, no other bird) seem to detonate in a puff of feathers around him. He actually teleports them to an island in the middle of nowhere, but as far as he's concerned, they explode. We totally need a new shelf for them though. We're running out of space.